The e-commerce industry is growing at very fast pace. especially if we review the data from last 5 to 10 years. No one would have imagined that an e-commerce company can beat Microsoft but it eventually it happened. And it also gives an idea that how much growth we can expect from this industry. Today we can make lots of money by selling products on eBay, Amazon or any other local e-commerce website. But during the period competition is getting higher and more and more seller are coming to sell the products online. And that’s what impact the revenue of the sellers. If you are an active seller of Amazon or eBay you must have seen that some sellers are making more revenue than others. And there could be many factors which can lead to low revenue. Like the type of products, decrease the demand, negative reviews, and Keywords research. So how can a seller manage all these metrics? 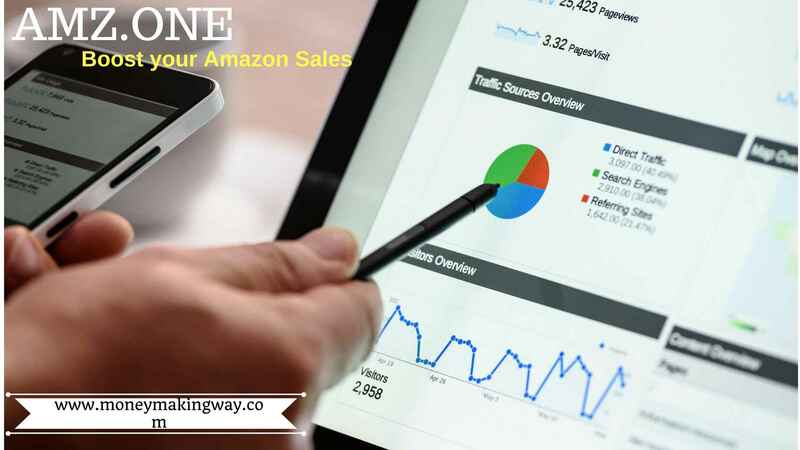 Amazon is now providing a tool through which you can increase your sales which would ultimately boost your revenue. AMZ.one provide all the required metrics which a seller need to increase sales and revenue. And the best part is that company is providing free access for 7 days before you make any payment. This is a most important part to optimize your products in Amazon search engine. A single missed keyword can affect your sales drastically. You might be missing tons of leads just because you did not choose the keywords which are related to your products. Keyword rank tracking gives you some of the important information like which keyword is generating more inquiries and sales. You can easily track & analyze keywords and optimize your sales. Pick any product from Amazon and enter the ASIN number and tool will give you all keywords associated with that product. This can also let you know which products are more profitable to sell. This is a best-featured tool that can help you to increase your profit. Here you can filter top 100 products in any selected category based on saler rank, sale price, and review. And the system will scan hundreds of stores online for best price. We can pull results on excel sheet and can do the analysis in order to target the profit-making areas. This data you can pull for last 60 days and you can find some highly profitable products for your online store. With the help of this tool, you can spy competitors inventory statistics like daily sales, total revenue, search volume and much more. This gives you the power to review the actual sales and revenue of others. And this also helps you to decide which are the profitable products in which you should also invest. You must have heard the term “search engine optimization” this is a technical term we use to optimize any content to rank in google. Here the same thing we need to apply to Amazon search engine. It receives substantial search of keywords as compared to Google. So it is important to optimize your products in Amazon search engine. This tool can help you to identify any missing metrics which is required for a product to get optimum search results. Like if the product description is short, proper keywords positioning and Image resolution is not good. These are the part of on page optimation which can be easily tracked with this tool. We know how important the reviews are for sellers. Nowadays before buying any products, the first thing we do is to analyze the product reviews. It gives you an idea how great the product is and how many other consumers are satisfied. And it can literally affect your sales if you got a couple of negative reviews of your products. So this tool can help you to minimize your negative review at earliest. The moment someone leaves a negative review of your panel system will send you a notification. Now you can approach the buyer and resolve the issue to remove the negative reviews. This tool doesn’t give a guarantee to make your negative reviews zero but this would surely help you to minimize the numbers. This helps you to increase the keyword rankings in Amazon search engine. Just select your product and all the keywords for which you want to create the redirects. now one redirects will use a combination of associated keywords to show you the results. So simply generate links and boost your rank in Amazon search engine. This feature allows you to pull all the emails based on keywords. And you can have direct interaction with your clients instead of visiting the website. You can professionally approach your client and send notification related to your products. If you are adding any new product and you don’t have any idea about keywords. you can use this feature to find some great suggestion related to your products. There are two ways of choosing the keywords first suggestion given by the tool or you can search the similar product from the website and pull all the keywords of an existing product. Now filter the desired keywords and apply to your own products. Currently, they have four plans basic, standard, advanced and professional but you can also try free for first 7 days from any of these plans. And if you do not want to use your credit card you can go for their trial plan but you would only be able to access only Four features. Which include sales tracking, negative review, keywords, and products. So it is a great opportunity for you to try this tool and measure your growth. If you feel the tool is working then choose any of their plans according to your budget. AMZ is the best tool to increase your sales and revenue. It provides perfect metrics to optimize your search results in Amazon search engine. And also provide a great suggestion for new products you can dive in. It also helps in removing negative reviews which plays an important role in increasing sales in e-commerce.